In 1987 Denis Sweeting DFC,198 Typhoon Squadron, first thought of the idea of a memorial for the pilots killed in the Normandy battles discussing it in June with General Yves Paul Ezanno DFC and Bar, CdeG, who had been the commanding officer of 198 Squadron during the Normandy campaign. It was also discussed with various Maires and dignitaries, but little interest was shown due to possible funding problems. Meanwhile, Monsieur Jacques Bréhin had already formed an organisation involved in digging up Typhoon aircraft and arranging burials of Typhoon pilots with full military honours. 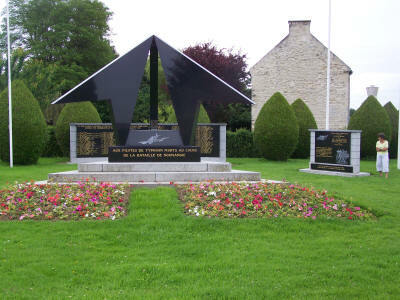 The association is called "Association pour le Souvenir des Ailes de la Victoire de Normandie". 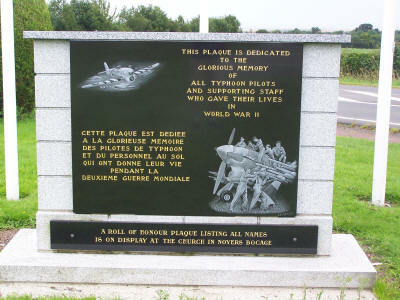 Their English translation, "Association for the Memory of the Wings over Normandy Victory". M. Jacques Bréhin is the President. The reason for his interest in the Typhoon. Jacques Bréhin was just a boy, a month from his 11th birthday, having experienced 4 years of enemy occupation, when on the 7th June 1944 (D-Day + 1), he witnessed an R.A.F. Typhoon hit by flak near Villers-Bocage. Jacques Bréhin saw the pilot parachute from the damaged plane and heard the aircraft crash to the ground and explode on his parents farm nearby. He was told by his parents that the pilot F/Lt Peter Roper had been seriously wounded. A German soldier had quickly found him, but left him because of his condition. Nearby, French families were doing all they could for the injured pilot who had landed on the farm of M. Lemenuel a tenant of Baron d'Huart who also owned the land rented by Jacques parents. This happening was to become one of the key factors in this memorial project. It remained a very vivid memory, starting M Jacques Bréhin on what was to become a great fascination for the Typhoon and its pilots. He grew up to become an Agricultural engineer, remaining a part time farmer with his wife and family at Tilly-sur-Seulles. During early 1969 Jacques' son Michel who had been made very much aware of the war during his upbringing, was taken to the crash site by Jacques' godmother. This led to even more family interest in the Typhoon which continued with greater enthusiasm as Michel got older and heard more about the war and the role of the Typhoons from his father. This resulted in Jacques and his son returning to the site in early 1984 to dig up F/Lt Peter Roper's aircraft. Many parts of the aircraft were recovered including the engine, which was taken to a Museum at Tilly-sur-Seulles. In mid 1984 Madame Marianne Gibert, a war time member of the French Resistance, and her husband, were told by a French couple they were convinced there was a pilot's body still in an aircraft which had crashed some 40 years before at Saint-Pierre-sur-Dives. Madame Gibert went with them to the site which was a small pond in a wood. Promising action whatever the cost, she later contacted the local Mayor and then Jacques Bréhin, having heard of his activities digging up aircraft. Jacques was confronted with all sorts of obstacles mostly from the U.K. Ministry of Defence, because of the possible presence of a body in the wreckage. The French at that time did not share these views but were reluctant to oppose them. In spite of this, on the 10th September 1985 Jacques' small team began work to pump water out of the site. They carefully moved down, recovering at depth the remains of the pilot, who was later identified as F/Sgt R.A.Thursby of 198 Typhoon squadron, Royal Air Force. After many formalities he was given a full military funeral. At last a missing pilot had been identified and buried to the great relief of his remaining relations. A fitting conclusion too for Madame Gibert's intervention and the French family who had tried so hard for 40 years to achieve this. The main thanks, however, must go to Jacques Bréhin who, with his most powerful driving force, never gives up, whatever problem he is faced with. His enthusiasm and dedication are exceptional by any standards. His determination to dig up crashed Typhoons, often against mounting resistance from the authorities and farmers (which he nearly always overcomes) must be greatly admired. You only have to attend this kind of military funeral to know how much it means to the families of the pilots, finally to know that their loved one has been laid to rest with a known grave. These experiences led M. Jacques Bréhin to discuss in late 1987 with General Paul Ezanno DFC and Bar, CdeG, his idea for a memorial to Typhoon pilots. Gen. Ezanno explained to Jacques Bréhin that the subject had already been raised with him earlier by Denis Sweeting DFC, but their approach to various Maires and dignitaries evoked little interest because of funding difficulties. As a result of the discussions, however, M. Bréhin contacted Monsieur Raymond Triboulet C.B.E. Ancien Ministre du General De Gaulle and a war time member of the French Resistance, now the President of the Comité du Débarquement / D-Day Landing Committee. This committee had assisted in the development and erection of memorials commemorating the Normandy campaign. After explaining his idea to M. Triboulet he was asked what he had in mind; Jacques then produced a drawing of a large rectangular memorial. Monsieur Triboulet brought out a pencil and drew a sketch on the back of the drawing with three broad arrows pointing towards the sky, stating firmly " this is what you want and we will help fund it." Jacques Bréhin acted on this support very quickly, by contacting a number of stone masons, and finally selecting Charles le Baron, Artisan-Marbrier.. Despite a formidable prediction of the cost, in keeping with my description of M. Jacques Bréhin, he replied without further thought, go ahead. The memorial to be constructed in Zimbabwe fine black granite, on a blue perle granite base from Brittany. M. Bréhin also contacted at this time Denis Sweeting for help in providing a list of Typhoon pilots killed during the battle of Normandy May - August 1944. After considerable research this was provided. Construction of the memorial started at the beginning of 1989. Where will it be located ? M. Bréhin stepped up his search for a suitable site. The general consensus of opinion had up until this time been Falaise, where so many hard battles were fought by the Typhoons against the German armour, with heavy losses on both sides. This location however threw up more difficulties than even M. Bréhin could overcome. Many reasons have been expounded, suffice it to say it was not possible. On the 7th June 1989, whilst attending other ceremonies in Normandy, we were taken by M. Bréhin to another site Aubigny near Falaise. This proved unsuitable, being somewhat remote, even though it was on the side of the main Falaise road N.158 from Caen, about 1.5Km's from Falaise. The next location investigated by M. Bréhin was Villers-Bocage, the scene also of very heavy actions, the most devastating being the 400 Lancaster bomber raid in daylight at low level, just after D-Day. This too was not possible, there was also not really a suitable site. THE MEMORIAL UNVEILING CEREMONY TOOK PLACE ON THE 9th JUNE 1990. First a Mass was celebrated in Noyers-Bocage Church, attended by dignitaries from the Allied Air Forces including General Ezanno DFC and Bar, CdeG, M. Raymond Triboulet OBE, Le Maire of Noyers-Bocage, M. Jacques Bréhin, relatives who could be contacted and Typhoon pilots from around the world. A guard of Honour was provided by the Royal Canadian Air Force Paris attache and hundreds of people from the local community also attended. Following the unveiling, 151 doves of peace were released. Many wreaths were laid on, and around, the Memorial. The stone mason M. Charles le Baron who attended had not at this stage been paid a single French Franc. Jacques Bréhin had also not received the promised help from the Comité du Débarquement, most probably due to the non authorisation of the full scale of money involved. M. Bréhin had again used his driving force to get a job done. He was clearly under a lot of pressure from M. Le Baron, with his own home being at risk. The first donation was not made until the 3rd August 1990 and this enabled Jacques Bréhin to make his first payment to M.le Baron on the 24th September 1990. During one of my many visits to Normandy with my Son Eric, we had another meeting with M. Bréhin and Fr. Yves Delouche, Yves as always kindly acting as our interpreter. We discussed at length M. Bréhin's wish, to now add a Name plaque to the Memorial site. In view of the fact that the Memorial had still not been paid for, a type of plastic material was discussed but quickly dismissed. We all agreed it should be of the same granite as the memorial, fine black granite on a blue perle granite base. M. Bréhin again selected M.Charles le Baron, not only for the quality of his work, but we still owed him a lot of money. The superb design shown on the Name Plaque photograph was produced, the appearance matching the existing Memorial. Work started on the Name Plaque in early 1993. On a visit in November 1993 we visited the stone mason and watched the laborious work, of cutting the roll of honour details, with a small chisel into the polished marble face, later this was to be filled with 22 carat gold leaf. In December 1992 we still owed a considerable amount of money. We all stepped up our requests for more donations. The Canadians, Andre Lord and Ken 'Chad' Hanna DFC, Denis Sweeting DFC, and the writer from the U.K., Australians, Bergy Bergmann KCVO,VL.K,KV,DFC.CdeG, Holland and Seymour 'Buck' Feldman DFC, from the USA all played a key part, most of our direct approaches being to Ex Typhoon pilots who were all very generous. M. Raymond Triboulet, Madame Marianne Gibert and General Paul Ezanno were still also providing large donations. This pressure for more funds continued throughout the following years. The Laborious work of engraving the 3,874 letters on the name plaque continued and then the gold leaf had to be applied. In March 1994 excavation and laying the foundations for the NAME PLAQUE took place by M. Charles Le Baron. By May 1994 the completed NAME PLAQUE sections were erected. THE NAME PLAQUE UNVEILING CEREMONY TOOK PLACE ON THE 8th JUNE 1994. 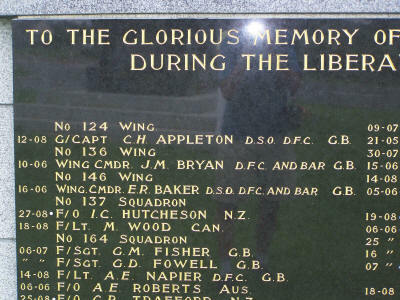 'To the Glorious Memory of the 151 Typhoon Pilots Who Gave Their Lives During the Liberation of Normandy May - August 1944'. 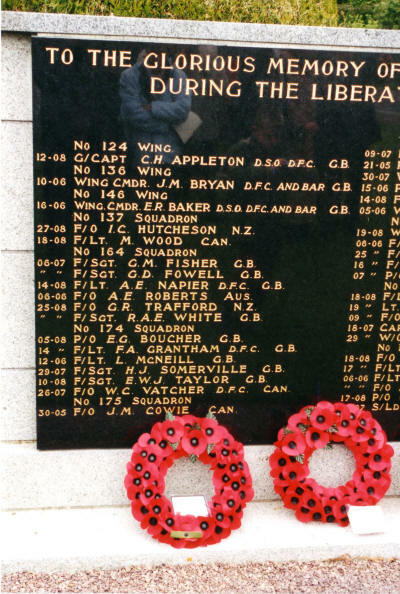 The name of Wing Commander E R Baker DSO, DFC and Bar appears third down on the left. First a Mass took place in Noyers Bocage church celebrated by the Parish Priest and supported in the service and translations by Fr.Yves Delouche. It was attended by dignitaries from The French Air Force, the Royal Air Force, Monsieur Raymond Triboulet C.B.E. ancien Ministre, Le Maire of Noyers Bocage, General Ezanno DFC and Bar,CdeG, M.Jacques Bréhin, relatives of the fallen pilots who could be traced, Ex-Typhoon pilots and supporting staff from different squadrons and countries from all over the world, and many people from local communities. There were also standard bearers from local veteran associations lining up six either side of the church exit. The standard bearers then led the procession to the Memorial, where they were met by a guard of honour provided by the French Air Force. The unveiling of the Roll of Honour Plaque was carried out by Air Vice Marshal Goodall CBE, AFC and Bar , Air Officer Commanding No 2 Group, Royal Air Force Germany and General Yves Paul Ezanno DFC and Bar CdeG. 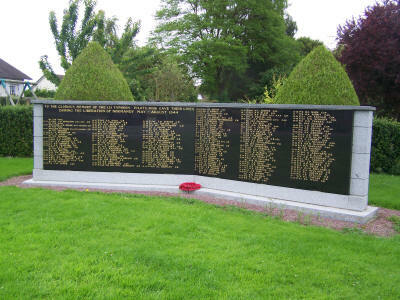 of the French Air Force, who removed the two very large French flags, exposing this magnificent plaque of polished granite, highlighted by the gleaming gold leaf of 151 names. The Air Vice Marshall and General then spoke to those assembled. Addresses were also given by M.Raymond Triboulet C.B.E. ancien Ministre , General Paul Ezanno DFC and bar, CdeG., Le Maire Noyers-Bocage M. Roland Heudier, and M. Jacques Bréhin, President of the Association pour le Souvenir des Ailes de la Victoire de Normandie, whose dedication and driving force had made all this possible. 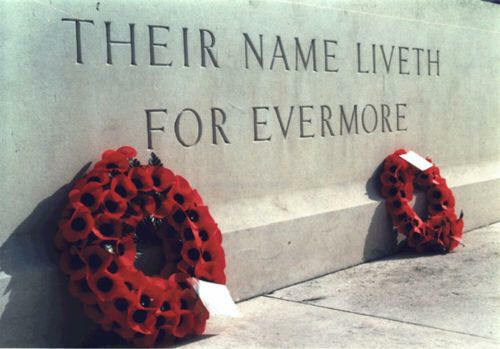 Many wreaths were laid both on the Memorial and Roll of Honour Name Plaque. A very moving occasion and a great tribute to the 151 Typhoon pilots who lost their lives. Attended by their Wing Commander, Air Commodore C.D. 'Kit' North Lewis DSO,DFC and bar, together with Ex-Pilots from Australia, Canada, Holland the U.K., and Supporting staff from the U.K., together with relatives of those who lost their lives. Translations at all these ceremonies were conducted with exceptional skill by our great friend Fr.Yves Delouche. Skilled translation support was also given by Mademoiselle Bérangère, during many occasions at Memorial functions. The hospitality and deep feeling shown by our French friends, and indeed by the local communities, will always be remembered by those attending these ceremonies. We who survived, are also very proud of this, the only Typhoon pilots Memorial, erected to our lost relations and friends.